Fundamental challenges to higher education—from rising student debt burden to increasingly severe state appropriations cuts—coupled with last week’s dramatic political shift provide us an unprecedented opportunity to clarify the critical role the Climate Leadership Commitments play in supporting our institutional missions. Since July, Second Nature’s New England Climate Leadership Alignment Initiative (NECLAI) has supported a cohort of signatories in mapping their institutional priorities and identifying tangible ways the Commitments contribute to these priorities. The New England Climate Leadership Alignment Initiative builds on the Big Ten and Friends Sustainability Group’s foundational work in priority mapping and strategic alignment. In 2014, Big Ten universities were facing a set of unprecedented challenges familiar to many U.S. institutions. To deepen their understanding of how sustainability can help address these challenges, the universities developed the Big Ten Prospectus. This collective, self-organized effort pooled resources to: 1) map priorities across the cohort through an in-depth analysis of each member’s strategic planning documents, 2) identify whether and how sustainability contributes to these priorities, and 3) pilot metrics to measure these contributions. Some participants used new language to advocate for the Carbon Commitment at the executive level and expand the role of the Commitment at their institution. For example, Lasell College Assistant Director of Plant Operations & Sustainability Roxey Connelly knew that she would soon be meeting with executive leadership to discuss the future of sustainability at her institution. She attended the NECLAI workshop and mapped the Carbon Commitment’s contributions to her institution’s strategic priorities. The alignment exercises helped her frame the value of the commitment and make a case for proposed initiatives on campus. Since then, leadership has raised the profile of sustainability and expanded the role of the sustainability committee in supporting campus projects. The committee has begun compiling a proposal for this year’s “green project” and started the process of updating the campus climate action plan. At Wesleyan University, Sustainability Director Jennifer Kleindienst knew that the school would be undergoing a new strategic planning update. She used these tools to make a case for the inclusion of several key activities associated with the Carbon Commitment. Jennifer sourced language from the institutional priority mapping and alignment work to make a case for the relevance of these activities to the planning process. She has also followed a similar process in crafting key performance indicators for sustainability for the Board of Trustees. Colby-Sawyer College has a new president at the helm and a comprehensive strategic planning effort underway. Director of Sustainability Jennifer White mapped the school’s current strategic priorities to gain a deeper sense of the Carbon Commitment’s contribution to those outcomes. She hopes to use these same processes to reframe and redesign their current Climate Action Plan and make a case to the institution for the value of signing the Climate Commitment. Schools also used this program to inform the Commitment planning process. Two months into the program, Emerson College President Lee Pelton signed the Climate Commitment, integrating resilience into institution’s existing carbon goals. Sustainability Coordinator Amy Elvidge is using this opportunity to reboot the campus’ sustainability committee and reframe the climate action and resilience planning processes using the five strategic priorities in Emerson’s institutional plan. This process will inform the committee’s larger narrative regarding how sustainability and the Climate Commitment support Emerson’s institutional objectives. Emerson’s focus on strategic priorities will influence who they recruit for the committee (e.g., broadening the scope to stakeholders outside of facilities people, including staff from student leadership). Examples of priority mapping and commitment alignment work. At Eastern Connecticut State University, Institute for Sustainable Energy Director Lynn Stoddard realizes that long-term institutional commitments to sustainability, carbon neutrality and resilience hinge on fuller integration across institutional departments at the school. Building on a strong relationship with the president, Lynn is using priority mapping and strategic alignment to reframe the relevance of sustainability and the Climate Commitment among other members of senior staff. She is working to help these executive leaders understand how sustainability initiatives help the university meet its strategic objectives and current challenges by supporting recruitment, retention, student engagement and reductions in the operating budget. Several participants also found that this process could help them reorganize their campus efforts for greater impact. Identifying how the Carbon or Climate Commitment can support an institution’s strategic priorities helped schools build broader coalitions. For example, at Clark University, Director of Sustainability Jenny Isler is using strategic alignment to identify diverse new stakeholders for and frame the work of a committee aimed at building a robust case for how and why climate resilience is central to Clark University’s mission. By mapping both the institution’s stated strategic objectives and those emerging since the plan’s release, then aligning the Climate Commitment with these priorities, Jenny found new allies in departments with whom she had limited contact previously. She first recruited them for a focus group to identify substantive reasons for signing the Climate Commitment and create a statement of support encouraging the President to ask the Board of Trustees to sign. She used the process to frame this analysis of how the Commitment contributes to the future of the university’s mission and emerging concerns. At the University of Massachusetts Amherst, Campus Sustainability Manager Ezra Small is leading the Chancellor’s Sustainability Advisory Committee (CSAC) in a priority mapping process to build a stronger case for the Climate Commitment. In the first session, CSAC members identified the ways in which sustainability and Commitment-related activities contributed to a set of priorities identified through a recent strategic planning process. 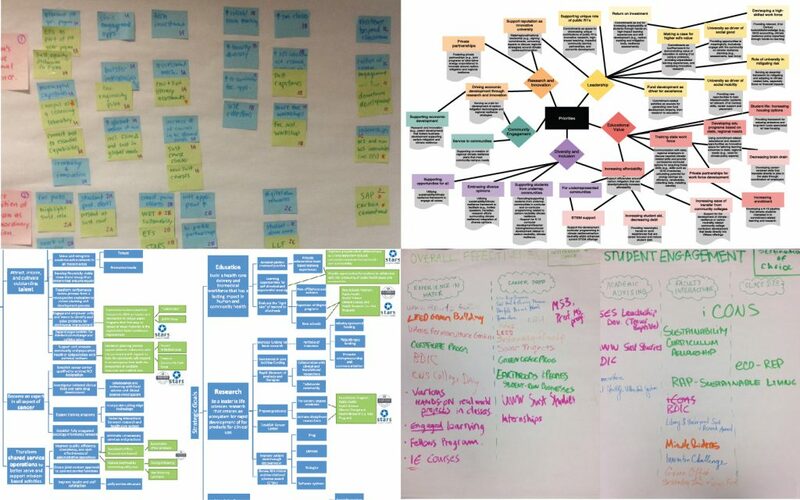 At the University of Massachusetts Medical School, Sustainability and Energy Manager Suzanne Wood used an extensive priority mapping and strategic alignment exercise to uncover important new connections between the Carbon Commitment and institutional objectives—especially rich academic opportunities. She soon plans to share a robust document, which reframes the commitment in the language of strategic priorities, with executive leadership. She has already begun to reach out to new allies identified through the process to strengthen the campus sustainability committee. Ultimately, she sees this alignment work informing future planning and the medical school’s approach to STARS. We outlined the steps in the priority mapping and Commitment alignment process, and providing resources to help you apply this to your institution. Oliff, P., Palacios, V., Johnson, I., & Leachman, M. 13). Recent Deep State Higher Education Cuts May Harm Students and the Economy for Years to Come. Washington, DC: Center on Budget and Policy Priorities. Reed, M. & Cochrane, D. (2014). Student Debt and the Class of 2013. Washington, DC: The Institute for College & Success: The Project on Student Debt. Taylor, P., Parker, K., Fry, R., Cohn, D., Wang, W., Velasco, G., & Dockterman, D. (2011). Is College Worth It? College Presidents, Public Access, Value, Quality, and the Mission of Higher Education. Washington, DC: Pew Social and Demographic Trends.